Synopsis: Tons of fun for the whole family is in store with this comprehensive collection of the most unforgettable, exceptional and memorable commercials to hit the small screen. This is an entire history of American pop culture in its most eloquently simple and straight-forward form. Enjoy reminiscing about years gone by while watching all of your favorite commericals from the past! 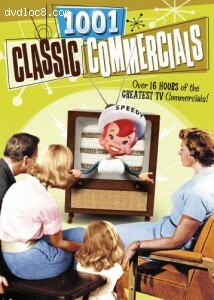 Includes legendary favorites from some of the most well-known household brands like Speedy from Alka-Selzter, the Jolly Green Giant, Barbie, Marlboro, Chevrolet, Charmin, Ajax and many more!